A former phlebotomist, computer programmer, supermarket worker and keen cyclist are four new police community support officers who are looking forward to getting their teeth stuck into the job. The Safer Neighbourhood Team, which is made up of PCSOs and PCs, works with the community to improve the quality of life for residents and make the area safer, by proactively tackling crime and anti-social behaviour. Fresh from an intensive six-week training course, new PCSOs Braddan Webber, Max Nethell, Nigel Haggar and Tom Ross have joined the team and are looking forward to the challenge. PCSO Braddan Webber is covering Berkhamsted town centre and prior to joining, he studied sports therapy at the University of Hertfordshire. More recently he worked as a phlebotomist at Watford General hospital, taking blood from people to diagnose illnesses. Braddan, 25, from Watford, said: “Joining the police has always been something I wanted to do even as a child, I have known many people who are or were members of the police and I have always been excited at the prospect of getting stuck into crimes or anti-social behaviour. “The beat I will be covering will be Berkhamsted town centre, focusing on the High Street between Castle ward and Berkhamsted East. PCSO Max Nethell, 19, from Stevenage is covering Tring town centre and previously worked in a bike shop, as he has a keen interest in cycling. He said: “I have always been interested in joining the police. I like talking to people and helping if I can so this seemed an ideal job for me. “I also like the fact that no two days are ever the same in the police force which keeps you on your toes and means it is never boring. “I hope to tackle the anti-social behaviour in the local area, around Silk Mill Way and in Dolphin Square as I know these are areas of concern to residents. There has also been a number of cars being damaged in the local area or items being stolen from them, so I will be working to reduce further incidents by being a visual deterrent and by offering the community crime prevention advice. PCSO Nigel Haggar is covering Grovehill and Woodhall Farm in Hemel Hempstead. Nigel, 54, from Hemel Hempstead says he applied for the role because of the community focus it provides. He previously worked as a computer programmer which took him to America during the millenium in 2000 and was also there dring 9/11 the following year. He has also worked in banking, but more recently was in customer services at Asda. He said: “I decided to join the police force as I have had a lot of previous face to face experience with customers and people in the community. “I wanted to stretch myself further and build my knowledge of the community and the people in it. “I hope to help with reducing low level crime within my beat by getting to know the main offenders within the community in order to educate them and divert them from this behaviour. PCSO Tom Ross will be covering the Highfield area of Hemel Hempstead. Tom, 24, from Welwyn Garden City worked at Waitrose for nine years before applying to become a PCSO. He said: “I mainly joined the Constabulary because it’s been something I’ve wanted to do for many years and I also have members of my family in the force. I also want to give something back to the community and more importantly help people. “I’ll be covering Highfield and I hope to help tackle graffiti and anti-social behaviour which has been reported in the area. Herts police and crime commisioner David Lloyd said: “PCSOs are firmly embedded within their community and are often the first port of call for people who are experiencing problems or those who just want some friendly police advice. 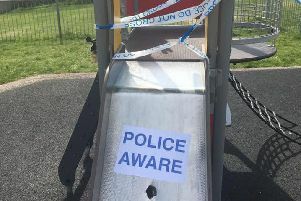 “As part of their role they will actively work with the community and partner organisations to find long-term solutions to anti-social behaviour. Dacorum’s Chief Inspector Doug Black said: “I warmly welcome Braddan, Max, Tom and Nigel to the policing team here in Dacourm. “A large amount of their time will be spent out on the streets in their areas, speaking with residents, and importantly, providing a visual deterrent to criminals. You can contact the PCSOs direct via email (firstname.surname@herts.pnn.police.uk) or phone the non-emergency number, 101 and ask for the team or you can call them on their airwaves, if they are on duty. Dial 01707 354192 and say the name of the officer you wish to speak to. Always dial 999 in an emergency.